This is Kristie Smith's debut in the calendar world (as well as on Golf Babes), but you'll probably be seeing much more of her. She's a very accomplished Australian golfer with some big amateur wins on her resume, and who is now embarking on a professional career. Kristie, who turned 20 earlier this year, plays in the Futures Tour qualifying tournament next week. But she has also made it into the LPGA's Q-School finals for the second straight year, and will attempt in December to earn a spot on the 2009 LPGA Tour. Kristie grew up in a golf family; her father is a golf professional in Australia who played on the Oz pro tour circuit back in the day. The year 2005 was Kristie's "coming out" on the Australian golf scene. She won several junior tournaments that year, and set a couple course records. She also become the youngest-ever winner of the Western Australia State Amateur Championship. Prior to turning pro earlier this year, Kristie made 2008 her greatest amateur season, winning the Australian Women's Amateur Championship (25 years after her father won the men's amateur), plus the very prestigious North & South Amateur in the States. She was also low amateur in the Australia Open (where she tied for fifth), the New South Wales Open and the ANZ Ladies Masters. The photo is, of course, from the 2009 Australian Women of Professional Golf Calendar. Sunny Park is Miss July, so to speak, in the 2009 Australian Women of Professional Golf Calendar, which features Australian golfers who play on the ALPG. Sunny was born in Korea but moved with her family to Australia at a very young age. She didn't take up golf until age 14, but quickly became one of Oz's top juniors. Her amateur career culminated in 2007 when she won the Australian Ladies Amateur Championship. 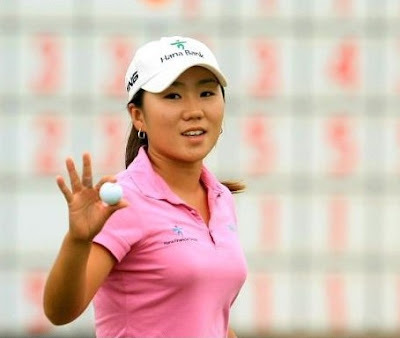 Sunny turned pro later that year and played her first tour events on the ALPG, starting fast: a tie for fifth at the Angostura Castle Hill Pro-Am and again at the St. Michaels ALPG Classic; followed by her first professional victory at the Peugeot Kangaroo Valley ALPG Classic. Coming up, Sunny will be playing in the Futures Tour Qualifying Tournament Nov. 4-7. Morgan Pressel was having a solid 2008, with four Top 10 finishes, a couple near-misses at wins, Top 30 on the money list. But no victories since her first one at the 2007 Kraft Nabisco Championship. Until Sunday. Pressel sank a 22-foot birdie putt from off the green on the final hole to win the Kapalua LPGA Classic. Andrea VanderLende is one of the contestants on "Big Break X: Michigan." A native of Michigan herself, Andrea played college golf at the University of Florida, where she captained the team in 2003-04. She was the runner-up at the 2003 NCAA golf championship. Andrea turned pro in 2006, but didn't immediately pursue a tour career, opting to become a golf professional at a North Carolina club. Her rookie year on the Futures Tour was 2008. While she made only a handful of cuts this year, when she did she played well through the weekend: three Top 25s in four opportunities, including an 11th-place finish and a fifth. Those of you out there hoping and hoping for a Paula Creamer bikini calendar (you know who you are!) will have to be satisfied - for now, anyway - with this watermark-obscured sample from Creamer's 2009 calendar for Golf Digest Japan. This is the third year that Creamer has done a calendar for GDJ (click her name in the labels below to see examples from prior years), which, alas, is available only in Japan. LPGA career win No. 1 came for In-Kyung Kim on Sunday at the Longs Drugs Challenge, where she bested runner-up Angela Stanford by three strokes. IK is in her second season on the LPGA. In 2007, she got as high as a second-place finish and wound up 31st on the money list. Heading into the Longs Drugs, IK had a best finish of tied for third this year, with four other Top 10s, and hadn't finished outside the Top 20 in her previous five tournaments. Random fact about Bernie Luse: Her dad calls her "Monkey." Bernadette is a cast member on "Big Break X: Michigan," which premiered on the Golf Channel last night (Oct. 7). Despite not picking up the game until age 15, she got good enough fast enough to win the Florida girls high school state championship. She went on to play collegiately at Mississippi, graduating in 2003 after majoring in psychology (which probably helps her deal with the fact that her dad calls her "Monkey"). After turning pro in 2003, Bernie won a tournament on the Next Generation Women's Tour and then played the Futures Tour in 2004. She made it through Q-School later that year and was a rookie on the LPGA Tour in 2005. Luse was the first player ever from Ole Miss to earn LPGA membership. She had non-exempt status on the LPGA in 2006 and then, the Golf Channel says, her sponsorship money ran dry. Now, competing in "The Big Break," Bernie is looking to jump-start her pro career again. There's already been one "Big Break" champion in the Prange family - Ashley Prange won "Big Break V: Hawaii." Can little sister Amber make it two championships for the Prange girls? The Golf Channel says that Amber "lost the desire to play golf and eventually took a nine-month sabbatical from the game following graduation." That would be graduation from the University of Washington. But Amber is now playing competitively again, getting into some Futures Tour events later in the season. It's hard to watch Hugo Leon and Camila Mori on golf course and not feel good. One look at the playful couple and you instantly know that they are in serious love and playing golf together makes them happy. They chat in Spanish, get serious to hit a shot and then it’s back to smiling. It looks too easy, too cutie, but it’s not an act, it’s merely natural. Mori won the Chilean National Amateur Championship in 2003 before beginning her college life at Campbell University, where she was the freshman of the year in 2004 and team MVP in 2005. She then transferred to South Carolina. Mori turned pro earlier in 2008 and got into three tournaments on the Futures Tour as the beginning of her professional career. Rachel Melendez is one of the cast members on "Big Break X: Michigan," which debuts on Oct. 7, 2008, on the Golf Channel. Originally from Puerto Rico, Melendez now lives in Atlanta where she is an instructor in the First Tee program. "I want my kids to see that they can do it and that someone who looks like them can accomplish things in golf," said Melendez. "Every shot I hit and every action I take I am always thinking about my kids. I do that because I want to set a good example for them." Melendez played collegiate golf at Penn State and Georgia, but left the golf team while at Georgia to focus on studies. She graduated with honors and was enjoying a successful career in corporate America when the golf bug struck again. She re-entered the game as an instructor, but now has her eye on returning to competitive golf. "I enjoy the teaching aspect, but with my game getting better and my confidence growing, that competitive drive is getting awakened," Melendez said.